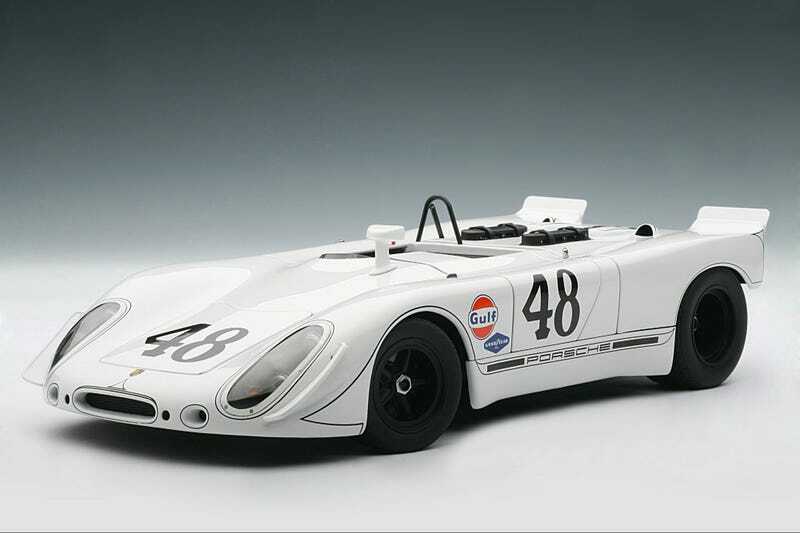 October’s Model of the Month is another in our series of classic diecast AUTOart 1:18s: the Porsche 908/2 Spyder driven by Steve McQueen and Peter Revson to a stunning 2nd place overall finish in the 1970 12 Hours of Sebring. That race was the stuff of legend, as McQueen (driving with his leg in a cast) and Revson drove a steady race that saw competition from the factory-entered Porsche 917s and Ferrari 512s fall by the wayside. In fact, McQueen and Revson nearly won the race outright, but were thwarted at the VERY LAST CORNER by a hard-charging Mario Andretti in a 512. AUTOart’s replica is an older casting, dating back six or seven years. Some might say this is a good thing, as this was a bit of a “golden era” for AUTOart, and the detail on the 908 makes it hard to disagree. The simple white livery on the McQueen/Revson car makes this detail pop, as it shows off both the clean design of the car as well as AUTOart’s attention to detail. Of course, lifting the engine cover shows where perhaps they spent most of the development money...the engine detail is outstanding. AUTOart recently discounted their wholesale price on this model, usually an indication that it’s about to go out of production (we won’t swear to this, but it seems to happen that way an awful lot). We were able to grab three of them in our last AA order, which we’re offering to the public at $119 (regularly $160). For LaLD readers, use promo code LALDOCT to save a further 15%...that’s $101.15 shipped in the lower 48. And did I say supplies are limited? Yep.